You Never Know Women is a thrilling romance that constructs a combustible love triangle between a Russian dancer, a handsome escape artist, and a wealthy broker. 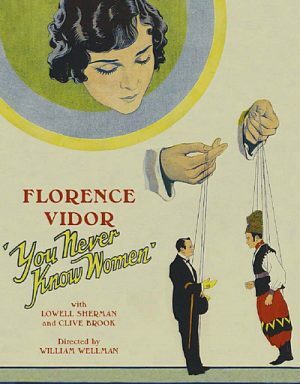 Vera Janova (Florence Vidor) is on her way to star in a Russian vaudeville revue when a falling girder nearly kills her. A construction worker saves her life, but before she wakes up the conniving Eugene Foster (Lowell Sherman) takes Vera into his arms, pretending to be the one who rescued her. Susceptible to Eugene’s oily charms, Vera begins ignoring Ivan Norodin (Clive Brook), a Houdini-like master of illusion who had loved her his whole life. Racked with jealousy, Norodin plans the ultimate illusion, one that could change their lives forever. Filmed with knockabout energy by the great director William A. Wellman, You Never Know Women is a silent era gem. • Audio Commentary by William Wellman, Jr.